Rate setting is more art than science, and an underwriter who wants the business can pick the rates he or she wants to offer. The good news is that insurance premium (at the higher commercial level) is driven almost exclusively by competition. Rate setting is more art than science, and an underwriter who wants the business can pick the rates he or she wants to offer. The bad news is there are brokers in the middle, and you cannot evaluate the product yourself to assure an apples to apples comparison. Understanding of the chart to the left is key to understanding how to control insurance cost. The insurance broker/underwriter dynamic is a major key to why you need an expert on your side. Please See Risk Management – You Need It, and Your broker Isn’t Providing It. The second reason you need an expert on your side, is to make sure any savings you achieve are real savings and not simply as a result of inferior coverage. Your proposal is five pages, yet the ultimate policy is hundreds. How can you compare? Be savvy and understand what you’re dealing with. And focus on the BIG numbers in the graphic above. The biggest number is premium – how can you achieve the best result in this area? The second largest number is broker commission. Commissions are incentives given by insurers for business steering – they have very little relationship to actual work involved. The broker compensation can be reduced. How do you work on these big numbers. By having a risk manager on your team. 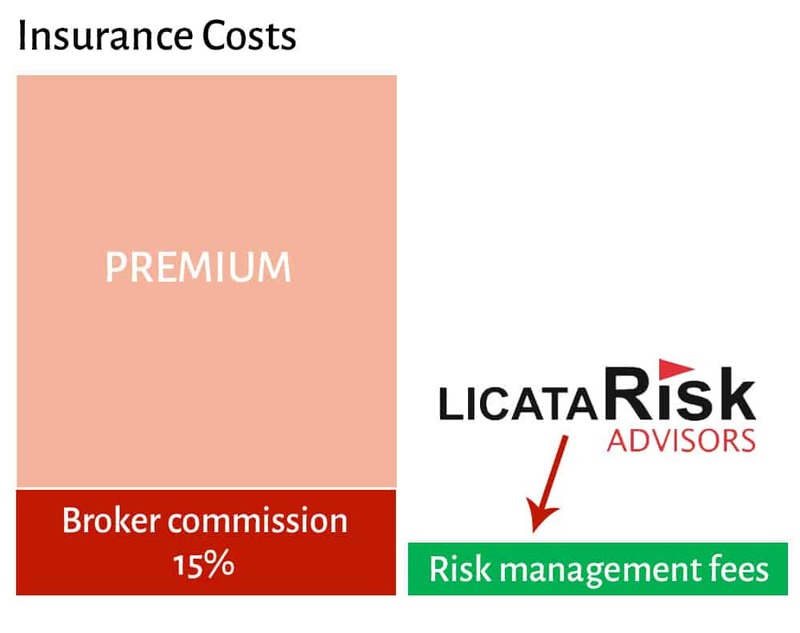 The risk management fee on the graphic is not exactly to scale, but very close. See more about how risk management affects cost. THEN we go back to the market and negotiate again. See Risk Management StreetSmarts for CEOs and CFOs to see how it all comes together. We’re always on your team, working hard to save your hard-earned money.